Previously on Educated Latina, we talked about the importance of finding a mentor in your workplace. Just as it is important to have a mentor in the workplace, it is equally as important to have a mentor in college. According to a 2011 study by the Institute of Higher Education, having a mentor often leads to students feeling more engaged and connected to their campus. Students that feel more engaged, are more likely to proactively be involved in campus organizations and pursue leadership opportunities. For many first-generation college students, this feeling of “belonging” also increases retention rates as mentors can help first-gen students when going through imposter syndrome and culture shock. With all the benefits of a college mentor, why does it take a while for first-gen students to purposely seek one out? Many reasons: 1) It’s hidden curriculum! (We’ll touch on this more next month.) It’s not always common knowledge that part of college success is contributed to having a team behind you—at least, it wasn’t to me. 2) It can be very intimidating to seek out professors, even if it’s just to chat. In high school, seeking out a teacher’s help was often seen as a last resort; it’s not stressed as an opportunity to network, unlike in college. This might seem like a no-brainer, but visiting office hours of the professors you like, is a sure-fire way to break the ice with someone you’re interested in building a relationship with. Especially because often times, office hours are underutilized. So go forth and take advantage of this open time! One of the ways I found my graduate school mentor was by looking for classes I was interested in outside of my degree. As a creative writing student, I knew I would be taking several classes with the same professors, hence why I wanted to search in the Latinx Studies department. As I searched the literature classes, I found something even better: A Latinx Creative Writing course—my two worlds combined. I emailed the professor and before I knew it, she became my mentor. Mentors aren’t always found in the classroom, but rather in the places we are already going to for support. They might be one of the counselors, the director, or coordinator. Resource centers are also a great place to find a mentor because these are spaces specifically created to support students. Is there someone that your friends can’t stop raving about how inspirational, strong, or helpful they are? Ask them to introduce you! Networking is a skill you must always work, so take advantage of getting to know the people your friends know—you might find that individual just as inspirational as your friend. Again, networking is the name of the game. Maybe the people you’re already working with know someone else who can help you achieve your goals. Feel free to ask them of any other people whom you could learn from. What Happens After You Find Your Mentor? As I mentioned before, mentors can help you through the tough times when college is feeling overwhelming. However, the importance of a mentor extends to your career and post-grad life. If you’re applying to graduate school, for example, they will ask you for a letter of recommendations from faculty (or sometimes even staff) you’ve either taken or worked with. A mentor who has known you for a number of years and who knows you outside the classroom/workspace will always be stronger than someone you’ve only interacted with through a class. They will know exactly how to sell your strengths, as opposed to emphasizing the good grade you got in the class. Mentors can also help you network. As the cliché goes, “It’s not about what you know; it’s about who you know.” Mentors have friends in many fields and areas of expertise, as they learn more about your interests, they can help you get connected or recommend you to fellowships, grants, etc. But most importantly, you get a life-long friendship. It’s cheesy but so true. I still communicate with many of the mentors I had in undergrad, either through Facebook, text, or phone calls. It’s an amazing feeling to know that no matter where I am in life, I will always have a group of people cheering me on. What are some other steps to finding a good mentor? Let us know in the comments below! 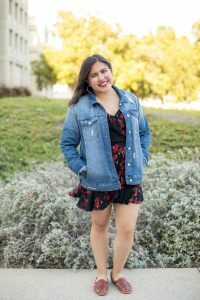 Genesis is a proud first-generation Mexican-American and college student currently working towards her Master’s at San Francisco State University. She graduated from Loyola Marymount University in the spring of 2016 before packing up her car to move to the City by the Bay. Grateful for her amazing experience with faculty and staff at LMU, Montalvo hopes to teach at the university level to help guide first-generation college students through the complex institution of college. When she isn’t at school or working, she enjoys spending her time running, writing, and binge-watching shows on Netflix.